Wait, Wasn’t Meryl Streep’s Mom Dead in the First ‘Mamma Mia’? Wait, Wasn’t Meryl Streep’s Mom Dead in the First ‘Mamma Mia!’ Movie? The Mamma Mia! sequel is bonkers. So bonkers that nothing really makes much sense in it. 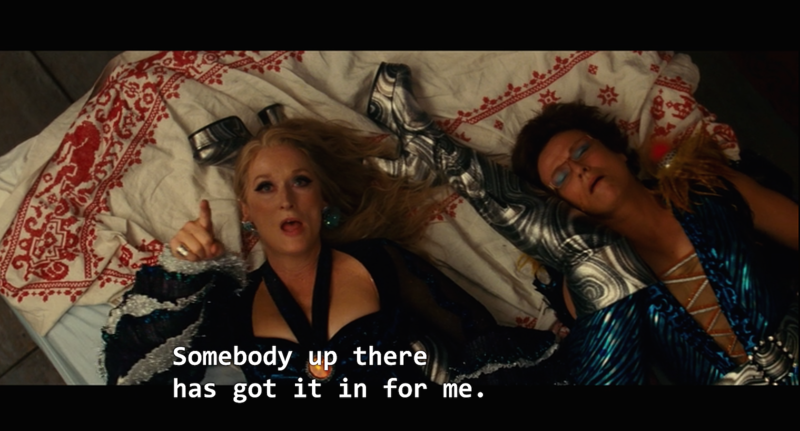 Like how Cher, who is three years older than Meryl Streep in real life, plays her character’s mother, Ruby. Or why Streep’s Donna Sheridan is – spoiler alert – suddenly dead in the follow-up with no explanation. But there’s something even more miraculously insane about Mamma Mia! Here We Go Again: it resurrects Cher’s character from beyond the grave. In Ol Parker’s follow-up to the 2008 movie, Cher’s Ruby arrives uninvited to her granddaughter Sophie’s (Amanda Seyfried) re-opening party for her late mom’s hotel. Ruby’s absence from the Mamma Mia! universe thus far is briefly explained away in a one-liner winking at the real-life diva: “She hasn’t been seen outside of Las Vegas in years.” Um, yeah, that’s because she’s dead. [Extreme Italian accent] Mamma mia! She’s dead! I mean, right? Donna is pointing to the heavens, and Tanya specifically speaks in the past tense. (Also, why wouldn’t Ruby also make a surprise appearance at Sophie’s wedding?) Well, some colleagues and folks on Twitter shared other (equally insane) possibilities with me. Perhaps Donna has not one, but three mothers. If that’s case, please give me a Mamma Mia! 3 where Donna’s three moms and Sophie’s three dads sing three hours of ABBA music. Universal, please cast Donna’s two other diva mamas with Barbara Streisand and Celine Dion. Guaranteed box office smash. OK but what if Donna’s mom is just hanging out on the second floor? Possible. The third and most believable explanation? I like this one. Maybe Mamma Mia! is secretly a musical adaptation of the Bible. Whatever the reason, Parker didn’t seem to think too hard on it when writing Here We Go Again. Actually, I’m not even sure he realized Donna’s mom was dead. He told Vulture that the scene in question, where Donna hints at her complicated relationship with her mother, simply inspired him to “go deeper and moodier” with the sequel. Deeper and moodier as in bringing a bedazzled woman who had a baby when she was three years old back from the dead? That settles it: Mamma Mia! is the greatest franchise of all time. ‘MAMMA MIA! HERE WE GO AGAIN’ REVIEW: HOW CAN YOU RESIST IT? Source: Wait, Wasn’t Meryl Streep’s Mom Dead in the First ‘Mamma Mia!’ Movie?